Dusty Dodge Director of Marketing, Engine & Performance Warehouse By Regis Finn Meet Dusty Dodge PHB: So Dusty, what was your first car? DD: My favorite family car in high school was a 1963 black Falcon station wagon, red inte- rior and a 260-ci V-8. What a "sleeper." My first car I could afford was a 1960 Corvair coupe. It was a great little car. PHB: If you could have any car, what would be your dream ride? DD: It's hard to nail down just one. I'm a big fan of the 1950s and '60s. Maybe an Austin Healy 3000, a 260 or 289 AC Cobra, or a 1966 to 1967 Mustang 289 fastback. 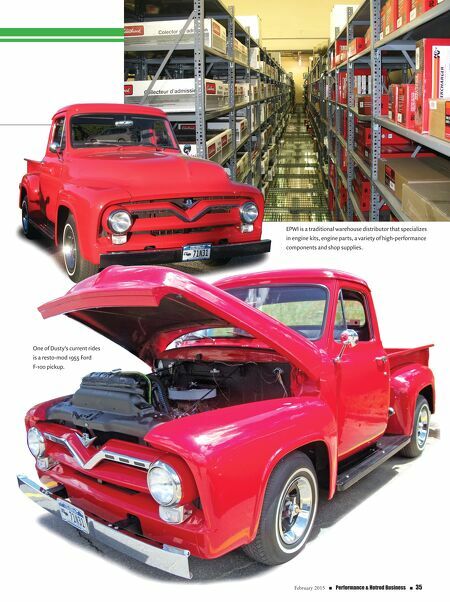 I own an oddball combination of my two favorite "affordable" vehi- cles—a resto-mod 1955 Ford F-100 pickup and a 1965 Corvair Monza four-speed coupe. PHB: What's on your computer/phone wallpaper? DD: Rotating scenes of various American landscapes. PHB: Who is the person you'd most like to meet? DD: Abraham Lincoln (he was a powerful communicator) and Alan Mulally (ex-Ford CEO). PHB: Dusty, please complete this sentence: "If I wasn't in the perfor- mance aftermarket, I'd probably be …" DD: … working for one of the many aftermarket parts manufacturers in product management, parts distribution and logistics. T oday we meet dusty dodge, who is in the process of retiring as the director of marketing at Engine & Performance Warehouse. 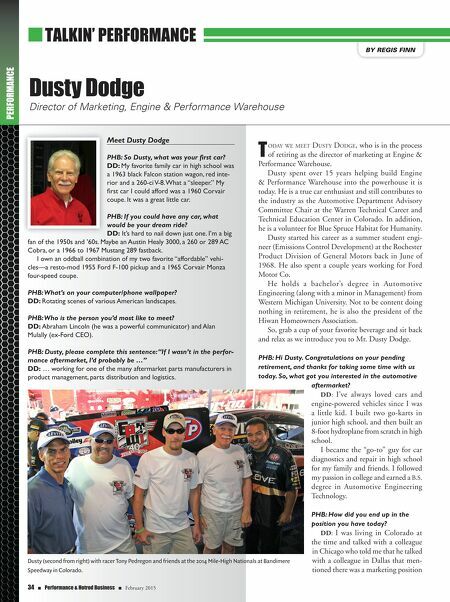 Dusty spent over 15 years helping build Engine & Performance Warehouse into the powerhouse it is today. He is a true car enthusiast and still contributes to the industry as the Automotive Department Advisory Committee Chair at the Warren Technical Career and Technical Education Center in Colorado. In addition, he is a volunteer for Blue Spruce Habitat for Humanity. Dusty started his career as a summer student engi- neer (Emissions Control Development) at the Rochester Product Division of General Motors back in June of 1968. He also spent a couple years working for Ford Motor Co. He holds a bachelor's degree in Automotive Engineering (along with a minor in Management) from Western Michigan University. Not to be content doing nothing in retirement, he is also the president of the Hiwan Homeowners Association. So, grab a cup of your favorite beverage and sit back and relax as we introduce you to Mr. Dusty Dodge. PHB: Hi Dusty. Congratulations on your pending retirement, and thanks for taking some time with us today. So, what got you interested in the automotive aftermarket? DD: I've always loved cars and engine-powered vehicles since I was a little kid. I built two go-karts in junior high school, and then built an 8-foot hydroplane from scratch in high school. I became the "go-to" guy for car diagnostics and repair in high school for my family and friends. I followed my passion in college and earned a B.S. degree in Automotive Engineering Technology. PHB: How did you end up in the position you have today? DD: I was living in Colorado at the time and talked with a colleague in Chicago who told me that he talked with a colleague in Dallas that men- tioned there was a marketing position n TALKIN' PERFORMANCE PERFORMANCE 34 n Performance & Hotrod Business n February 2015 Dusty (second from right) with racer Tony Pedregon and friends at the 2014 Mile-High Nationals at Bandimere Speedway in Colorado.